The Emerald Regiment is already preparing for the 2018 marching season. Band director Steve Matthews teaching at Jefferson Middle School next year, so the band will be led by Patrick Sullivan. With the knowledge acquired from Matthews and the experience that he has, Sullivan has the tools to lead the marchers to another great year. The marchers look to the next marching season with much anticipation. The Emerald Regiment will play a show that has a more similar sound and theme to the 2016 show, Classically Twisted, and will feature the hit song “Thriller” by Michael Jackson. Freshman Clyde Silvey eagerly awaits next season with great interest. Freshman Zack Gaines also anticipates the arrival of the marching season. With experience as a marcher, he plans on coming back as an even better performer than before. Not only is it an honor to march with the Emerald Regiment, but it is an even greater respect to be a field commander. Tryouts started in mid-May, but results will not be in until the season comes around, adding to the suspense and pressure. Field commander positions are determined by the leadership shown throughout the summer camps. Showing leadership throughout these circumstances means that the position is well earned and that the right marchers are in a position of authority. Veteran marchers must apply for this position, and have interviews with the directors, to do a final determination of their commitment. Junior Jessica Fisher, an experienced marcher, has applied for the field commander position for the flutes. “Field commanders are responsible for setting a positive learning environment for their section,” she said, “and being an available [and] experienced peer to help assist band members that may feel lost with the drill learning process or other aspects of competitive marching. The Emerald Regiment is coming off of a solid season, winning their first two of four competitions in Lafayette, near St. Louis, Mo., and Edwardsville near St. Louis, Ill. Next, the marching band went to Owasso, Oklahoma, a suburb of Tulsa. There they took third place in finals. 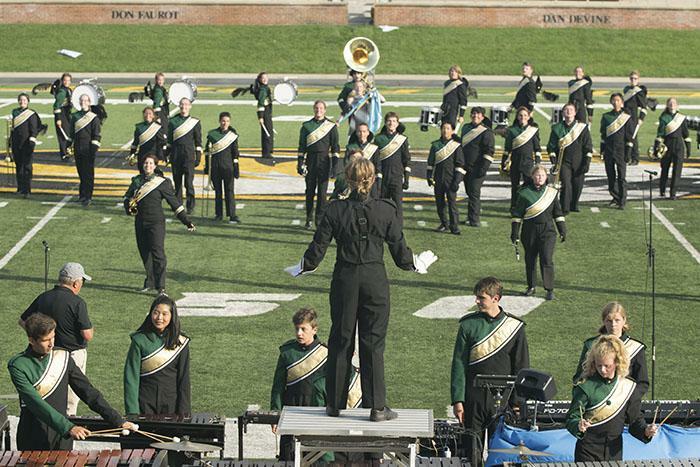 The final competition of the season was the Champion of Champions competition in the hometown of Columbia, at Faurot Field. There, they earned fifth place in the final round. This season, the marching band will return to Lafayette, Edwardsville, the annual Champion of Champions competition and will go to Tennessee for the Bands of America competition.